I've started adding an image to every post for the sole reason that it makes this blog look cooler in my post-Google Reader RSS reader (Feedly). Regular readers will recall that hydration has been a challenge throughout this adventure. Obviously it was tough when I was solely tube feeding. It takes a lot of time to get in both liquid food and separate liquids. Sometimes it felt like my whole day was devoted to those two activities. As I started using my mouth again, it was still tough to hydrate because I couldn't take more than one swallow at a time. And in the beginning even one swallow was a challenge. Even recently, it was still a little uncomfortable to drink a glass of water or juice. 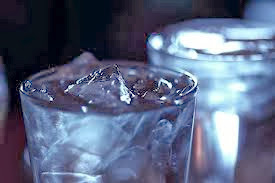 About two weeks ago, though, I noticed that I could drink a glass of water almost normally. So I've been doing so regularly and my hydration seems to be better as evidenced by many fewer instances of dizziness when I stand up. Today I actually felt thirsty. Sensations of hunger and thirst seemed to disappear for a while. Hunger has been back for a while but thirst is just returning. It felt good to drink a glass of water to quench it. One bit of bookkeeping: regular readers will also recall that I had quite a battle with constipation in the latter portion of treatment and for quite a while afterward. It got a lot better after we consulted a GI and I started taking four doses of laxative a day. A few weeks ago I started eliminating some of those doses until I was down to one dose a day. My bowel function was still far from normal, but at least things were moving. A week and a half ago I stopped taking laxatives entirely. I'm now happy to report that I have bowel function that closely resembles normal! I've reported that I currently can't taste sweetness. It means there is no such thing as a "treat" right now. But today I tried a bite size plain chocolate bar and it tasted a little bit good. I could definitely taste the chocolate flavor and maybe a tiny bit of the sweetness. The texture still gets funky after it's been in my mouth a few seconds but it's tolerable. A nice discovery. I continue to feel much stronger. I feel a significant difference over two weeks ago. A coworker today told me she can see a big difference over when I first showed up to work two weeks ago. It's encouraging to feel myself creeping toward normal. Back before treatment started I spoke with Friend Paul who survived Stage IV stomach and esophageal cancer in 2005 with treatment similar to mine. He said to me, "You're going to have three bad months and one especially crappy month but then it will be over. You will recover and the bad times will shrink into the past." I'm already starting to experience that. The worst parts of treatment are fuzzy memories. My main memories of that period are of all the loving care I received from Wonderful Wife and my sisters, parents and in-laws. That's not a bad way to remember it!